Environmentally sustainable Hyena Pan is a camp occupying a tranquil area in the newly rehabilitated Khwai Private Reserve where it overlooks a waterhole that consistently attracts big game and birdlife. Hyena Pan (named after the waterhole over which it looks), has been kept refreshingly simple, so guests will find they need just what they need to relax in comfort and no more to take up space or detract from the energy of the surrounding wildlife. 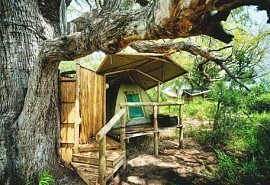 There are only 8 safari tents, each of which has twin beds, an en suite bathroom, solar-powered lighting and plug points, mosquito-proof mesh nets, a wardrobe, and luggage rack. 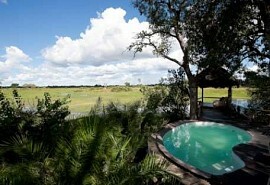 Hyena Pan was designed around low impact living and basic bush pleasures, of which there are plenty. 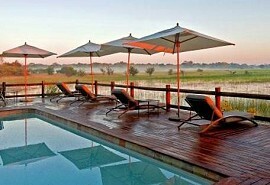 There is a small splash pool at the main camp area, which consists of a large viewing deck equipped with al fresco dining area, two covered lounges and a long dining table, and is positioned to overlook a boma, fireplace, and the wilderness beyond. 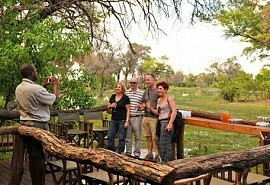 The camp is in a clearing beneath towering mopane trees, and has no fences surrounding it to keep the wildlife out. The beauty of Hyena Pan is that anything might emerge from the thickets and arrive at the brim of the pan. The camp is located in the interior of the private reserve, and it is a sanctuary for migrating zebra, elephant, and buffalo, which move through on their routes. 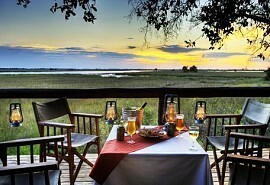 Khwai Private Reserve needs no introduction, as its position as a fenceless neighbour to both Chobe National Park and Moremi Game Reserve should speak a thousand words. The accessibility of wildlife to Khwai makes it one of the best places for a safari in southern Africa; however, the private 495 000 hectare conservancy means that Hyena Pan and its sister camps get sole access. 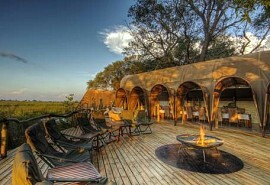 The lively “Hyena Pan”, over which the camp of the same name looks, is a constant hub of activity, while the camp itself is a place of serene tranquility. The surrounding mopane woodland is a habitat for sable and roan antelope, kudu, elephant, zebra, buffalo, lion, leopard, and of course, hyena. While not out on a game drive or bush walk, we suggest guests take a seat in the ground-level hide or on the 5m high platform, both of which are strategically located around camp.